We done eat it all up. 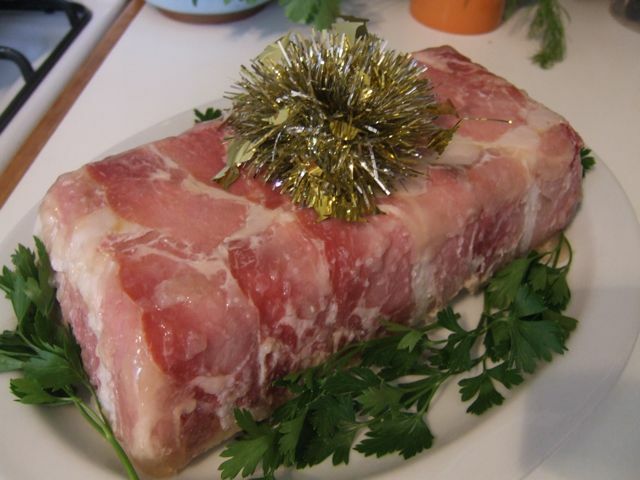 For no other reason except that I thought I should contribute to Christmas lunch at adventurebiscuit’s mum’s house, I decided to make a terrine the day before. My original plan was to go with a pork and bacon terrine of Rick Stein’s but it called for pork liver which I could not be bothered tracking down. And then I remembered a recipe in an edition of delicious. magazine (Dec 2008/Jan 2009 – sensational double issue!). 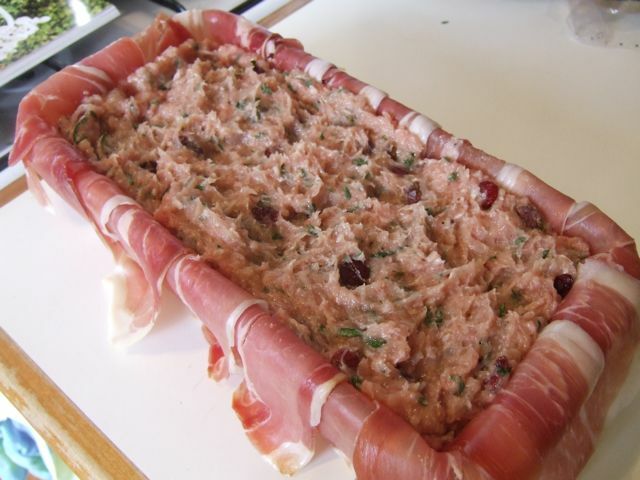 After finding it and checking that all the ingredients could be bought at the supermarket – pork and chicken mince, proscuitto, dried cranberries, brandy, pistachios, thyme, parsley, garlic, eggs – I turned the kitchen heat up to max. — complementing the sultry heat outside and ensuring that I would be wearing a glossy coat of sweat for the duration of my terrine making. (1) The black bits are dried cranberries. No insects in my cooking, nosirree. As instructed by the recipe, I greased my loaf pan and lined it with proscuitto (I was supposed to use pancetta or bacon but I substituted proscuitto instead). It cooked in a moderate oven while standing in a roasting pan full of water. 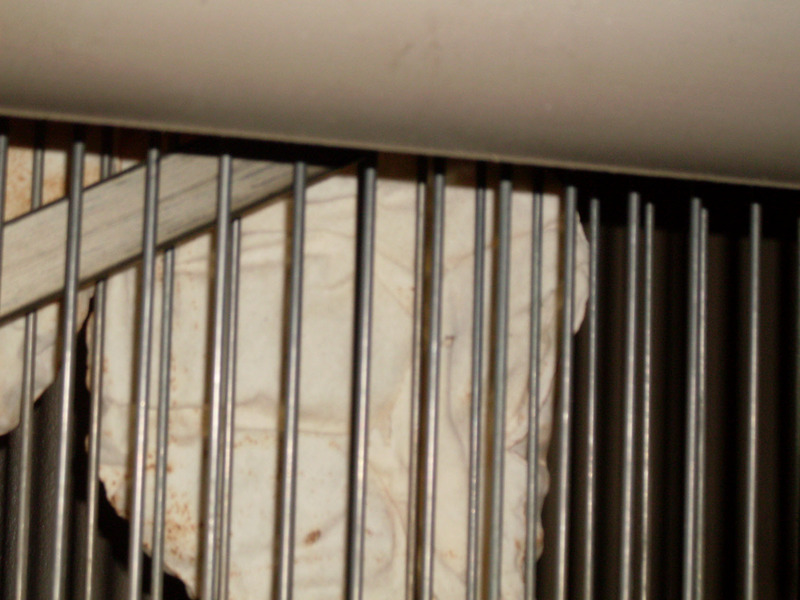 Overnight, it sat in the fridge with a brick on top of it to squash it flat. (2.) A brick of meat. It was tricky getting it on to a plate as it didn’t want to come out of the pan but eventually, success! 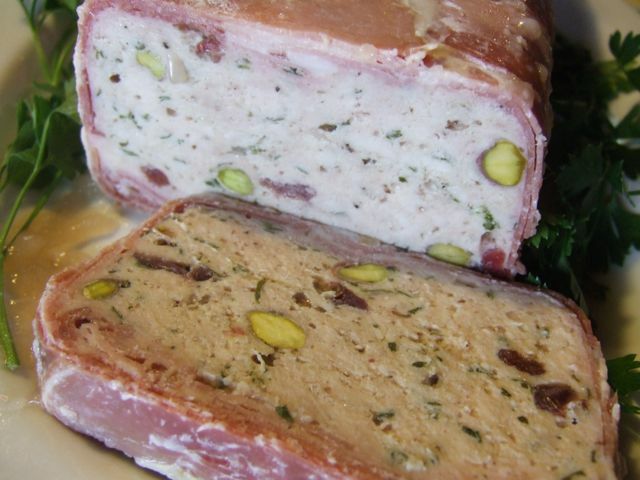 The terrine had a very subtle meaty flavour, which I gather from fauxfoiegras’ mum is a characteristic of terrines. It tasted best with a cranberry and onion marmalade that we found in the fridge, but it also worked well with pickle. Would I make it again? Depends how pressed for time I’d be. I prefer the stronger, richer tastes of pate and that’s the kind of thing I’d be looking for next time. However, at both Christmas and Boxing day lunches, everyone seemed to enjoy it and scoffed … virtually all of it! 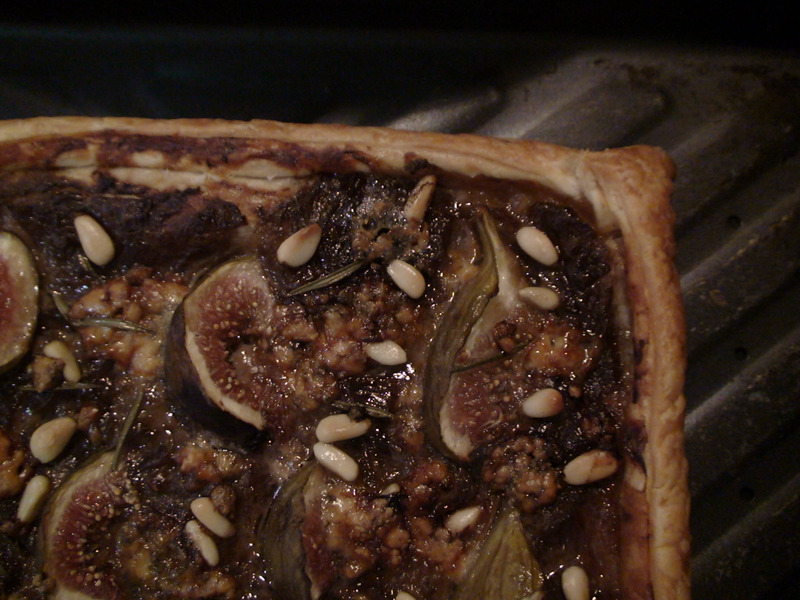 I had been waiting to find some figs in decent nick to make this recipe, as they are quite expensive and only available for such a short time. So, what better time to make this than for Christmas Day as a pre lunch snack- waiting for Cumin4ya to get his act together. This recipe originated in the New York Times, however, I spied it on Sassy Radish and salivated as I read through the post and looked at the pictures. I struggled a little with the recipe as some of it was in Metric and some in Imperial, it really didn’t matter in the end as I disregarded most measurements and cheated by using a jar of bought caramelised onions. Please note for the below recipe I skipped the honey completely and only lightly sautéed the bought onion with some rosemary in the hope of infusing some of the flavour into the onion- did not really notice a big rosemary presence apart from the fresh needles scattered on top after baking. As already mentioned, I did not follow this recipe, but the end result was a success! Good-quality honey for drizzling, optional. 1. In a large skillet over low heat, melt butter with oil. Add onions, rosemary and sugar. Cook, tossing occasionally, until onions are limp and golden brown, 30 to 40 minutes. Stir in the vinegar, scraping any browned bits from bottom of pan. 2. 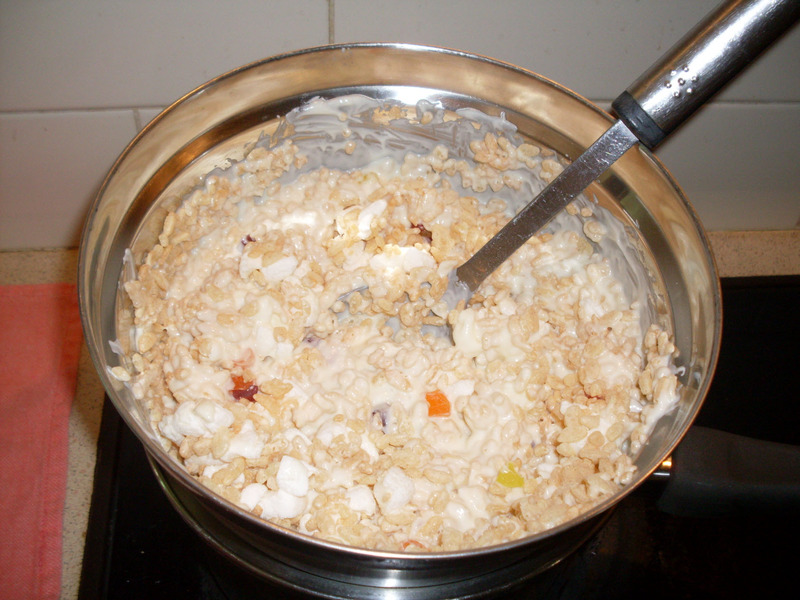 In a small bowl, whisk together the milk and egg until smooth. Stir in the onions. Preheat oven to 400 degrees. Line an 11 by 17-inch baking sheet with parchment paper. On a lightly floured surface, roll out pastry to a 9 by 12-inch rectangle. Transfer to baking sheet. 3. Use a fork to spread onion mixture evenly over pastry (let excess egg mixture drip back into bowl), leaving a 1-inch border. 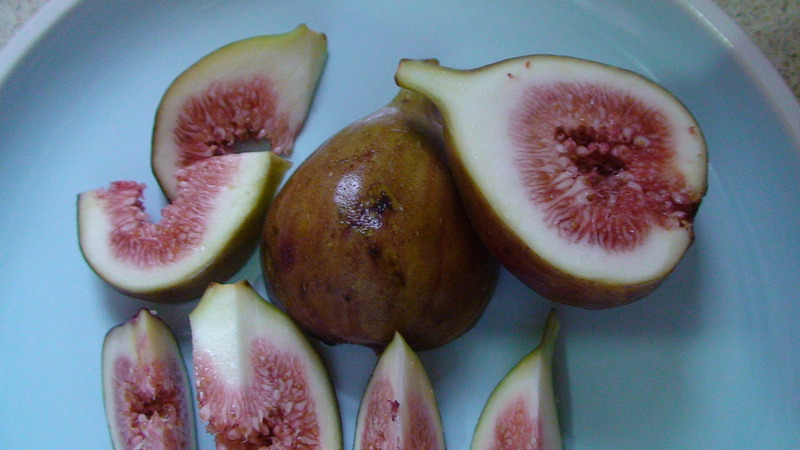 Arrange figs, cut-side up, in even rows on onion mixture. 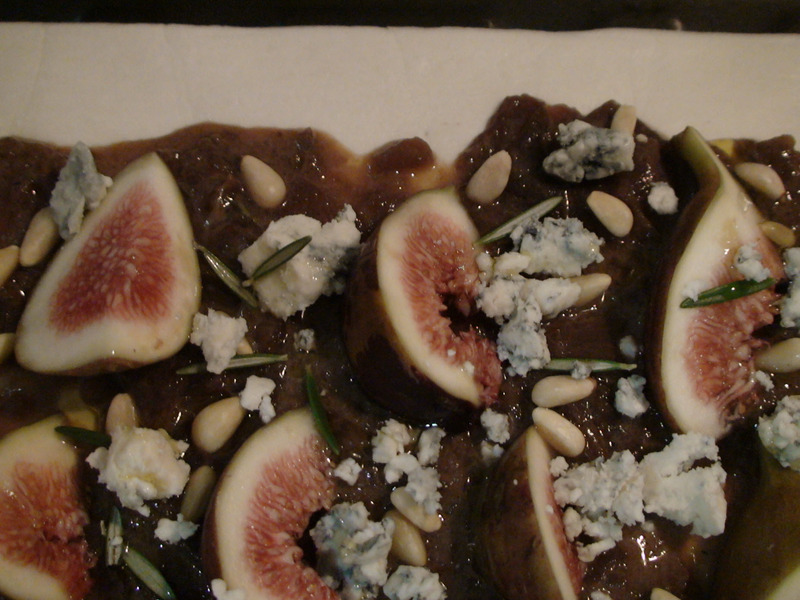 Scatter cheese and pine nuts over figs. Use a pastry brush to dab edges of tart with egg mixture. Gently fold over edges of tart to form a lip and brush with more egg mixture. 4. Bake until pastry is puffed and golden, 25 to 30 minutes. Serve, sprinkled with rosemary needles and drizzled with honey, if desired, warm or at room temperature. Best served immediately, but was still a hit on Boxing Day when Adventure Biscuit scoffed the lot! Last Tuesday night at Cubs, the pack made White Christmas. Our leader, Raksha, is a clever gal and knows The Black One is add/preserve free, so she called me and ran through the ingredients. 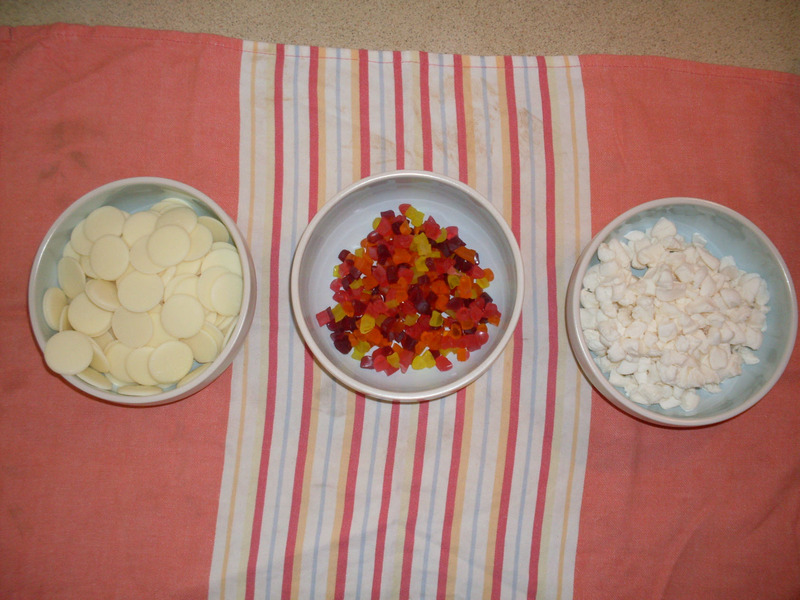 There were a few changes to be made, like Natural Confection Company snakes rather than just any old lolly snake, and white marshmallows only, not pink. Apart from that, we were good to go, although technically white chocolate does not pass the add/preserve free test, but we do make exceptions…especially as the school year is ending and it is Christmas! Melt chocolate over a pot of simmering water. 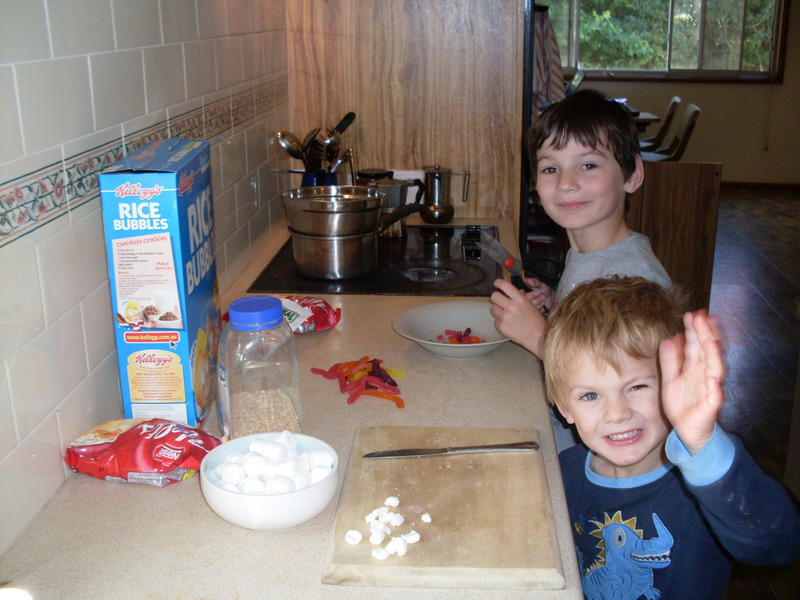 Mix bubbles, marshmallows, snakes and chocolate in bowl. Put patty cases onto tray, fill with mix. Place in fridge for 30 mins or until firm. As I have made this for The Black One’s class party, I lazily spooned the mix into two flat rectangular Tupperware containers and squashed it down with the back of the spoon. This will be easy to keep in the fridge and I can chop it into squares before I head to school for the party on Tuesday. I bet The Black One will scoff the lot! Gourmet Safari…Middle East in a Day. Today Cumin4ya and I took a Gourmet Safari of the Middle Eastern flavour through the inner west of Sydney. The Gourmet Safari’s are the brainchild of Maeve O’Meara, well known as the host of Food Safari on SBS TV. To our pleasant surprise, Maeve was our guide for the day, along with Sharon Salloum(Head Chef) of Almond Bar in Darlinghurst. The day began visiting Baalbek Bakery in Canterbury where we chatted with the owner over a Lebanese coffee, much the same as Turkish- very strong ,very black, very chewy and you take sugar regardless of the fact you may normally not. Maeve showing proprietor a photo of herself in the newly published Food Safari Cookbook. 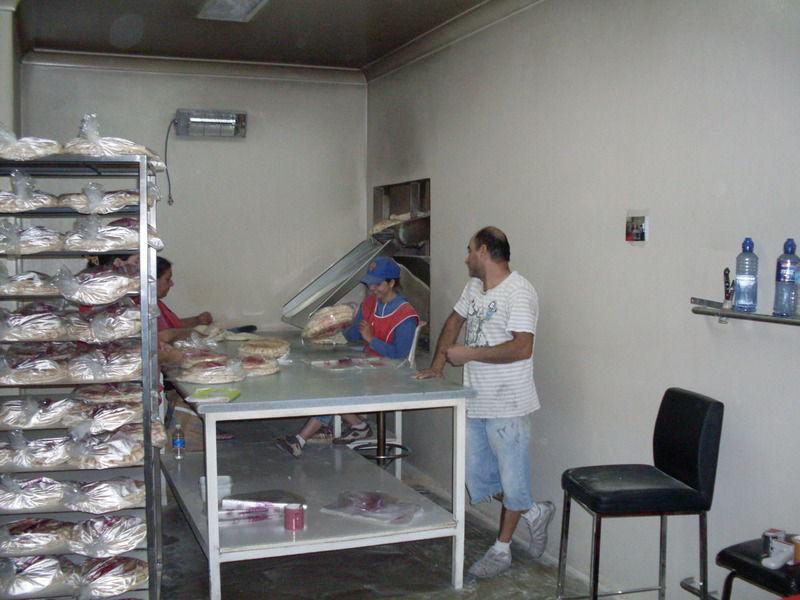 The real highlight of the visit was the walk through of the working bakery. From seeing a pile of kneaded dough ready to be placed on conveyor belts and trundle off to the 900C oven, to the delivery of the finished product through a hole in the wall where ‘the girls’ are ready to bag the bread for sale. Next stop was Man Oosh in Enmore for fairly traditional Lebanese pizza in terms of flat base and some of the choices of topping. The group tasted the Za’atar (Za’atar is generally prepared using ground dried thyme, oregano, or some combination thereof, mixed with toasted sesame seeds, and salt and is mixed with oil) pizza which is a breakfast staple of the Lebanese people, and a Meat pizza, which had spice and depth, but the Za’atar was the standout for me. The plucky young owner has plans to expand into the Sydney CBD, and if he remains true to his traditional recipes, he will have a strong following in no time. Can't remember the technical name for Meat Pizza? 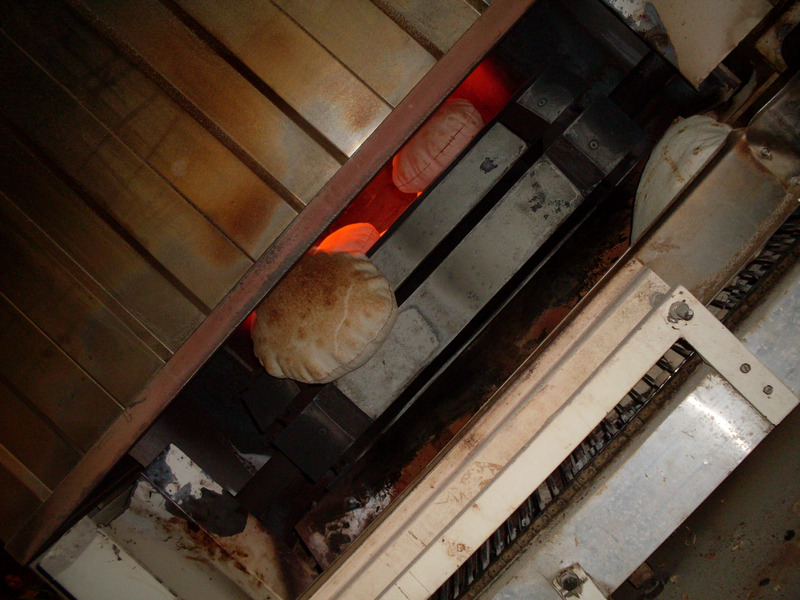 Right then, on we go to the star of the show, The Nut Roaster in Lakemba. This joint was established in the mid ’70s by Jimmy Afiouny who emigrated from Tripoli. Jimmy drew on his familial nut roasting techniques and The Nut Roaster is today, much more than that, it is a an Emporioum of all things Middle Eastern. Great set up on arrival with a tasting table prepared for us and an informative run down by Jimmy’s son Tarek. Who is that guy in the cap? The Kri Kri nuts are a killer( I bought a kilo for six bucks!) peanuts dipped in a mildly spiced flour mix and then roasted- oh so good! And then there is the Za’atar mix, the Lebanese feta rolled in herbs, the imported fig jam, the fresh roasted cashews and pistachios…what else did I buy? That’s right, a tub of silky creamy Grandpa’s Dairy Labni(Dulwich Hill) and some fridge fresh pizza bases so I can attempt my own version of Mr Plucky’s Za’atar pizza for breakfast! Hilarious! Ahmad thinks he is a bit of alright, and he is, as far as meat is concerned. The BBQ is set up outside Abu Ahmad Halal Butcher on the busy Boulevarde in downtown Punchbowl. As Maeve mans the BBQ and introduces Ahmad and he talks about what Halal means, Cumin4ya bends Sharon Salloum’s ear before she departs the tour. I just have one more question for you…when I was younger I used to go to my Leb mates house after school… his Mum always had a bowl of fresh herbs in oil on the table…was that Za’atar made with fresh herbs and not dried? I then chat to Sharon and tell her Cumin4ya was itching to get that last Q in before she left. She’s says, “He’s so cute!” with a giggle! All I can say is Cumin4ya is in his element! Rosewater and Pine nut sausages, yum, but not into cinnamon, and I could taste it. Garlic and Vinegar sausages VV yum, we bought half a kilo. Schwarma, marinated beef thinly sliced(not strips) and tasted both spicy and sweet- I suspect cinnamon was involved, but the balance was enough for me to tolerate. Bought a kilo! A few passersby decided to help themselves to the BBQ which was entertaining, and an old bloke who must frequent the butchery just settled right in. And Cumin4ya scoffed the lot! And now for some 50/50 news on the next stop, lunch at Al Aseel in Greenacre. The spread was traditional including hommous, babagnouj, falafel, tabouleh, pickled accompaniments of turnip, wild cucumber and green chillies. There was a dish I was unfamiliar with which was fishy- chilli fish with pinenuts and looked like it had tahini all over it. I don’t like fish if I can’t control ordering it myself, needless to say, I had more felafel instead. It was all very delicious and authentic as expected. I didn’t over do it, so did not feel too full for the next stop. I ran into a work colleague who is Lebanese- tick for a local dining here. Then who should walk in, but Mr Golden boot himself, Hasam El Masri- double tick for a local of noteriety dining here. Located opposite the lunch venue is Five Star Sweets, a curious place for the uninitiated. A spotless showcase of Lebanese indulgence. This is the place to come for celebratory baskets including; first child born, first boy born, weddings, funerals, return from Mecca… The only way to explain this is like bonboniere for weddings, everyone who visits the house when the baby is born, or the wedding is announced, or the person has died…is offered a token(fancy wrapped chocs) from the basket. And we had theeee most delicious selection of pastries, not just your average baklava either. I reckon Cumin4ya and I made right pigs of ourselves as we laughed with our fellow Safarians that this was death by dessert…then our informative host Muhammad brought out a plate of chocolate. I ate one and swooned, much to the amusement of my Safarians, I then went back for thirds as the centre of the choc was peanut brittle! Sorry, camera back on the bus! Sorry to say, but pretty disappointed here. When the ice cream is described as thick and ‘stringy like’ I expect it to be so. Na! Waterey and lacking in depth of flavour. Cumin4ya chose Passionfruit and Boysenberry- raved about the Boysenberry, but thought the Passionfruit was so so. I tried the Pistachio(so predictable) and the Mango(and so predictable) and was left, well, speechless. Speechlessly disappointed. If the wrap was not so big, I might have been satisfied, but you know me- talk it up and I am thinking big! I could have done with ending the day at 5* myself. I would recommend a Safari to anyone from my overall experience. A useful thing to note is the feedback form on the bus on the way back and also the very open nature of the tour guide- Maeve in this case, the business owner. Living in different towns let alone different states means that my family and I don’t often get together to eat, cook or talk about food. And, for me personally, I like to talk about food. I like to hear what others are cooking, eating, throwing down the toilet so that I can do the same. This blog is an attempt to address this failure of modern living. I’ve enlisted my nearest and dearest from across Australia and we’re going to have a conversation about food. Good food, fantastic food, unusual food, how-to-cook food — as well as food failures, food fuckups, and food follies. And just as topics of conversation come from left-of-field and follow their own paths to be overtaken by something coming from right-of-field, this blog may very well do the same. – oldspice is a wonderful cook and gardener who will show us some of the things in her garden and on her table. With all of these different interests, we may have plenty to talk about or we may end up talking about … nothing. And if that’s the case, we’ll just go back into our kitchens, cook up something delicious, sit down somewhere comfy and … scoff the lot (had to get that in somewhere).